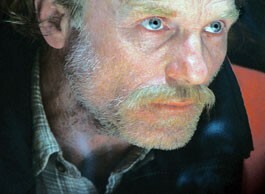 PATER PATTER: Ed Harris signed on to play the father in 'Touching Home,' the inaugural indie film released by CFI. Perched onstage at San Rafael's Christopher B. Smith Rafael Film Center, moments before the official April 29 theatrical debut of the movie Touching Home, actor Ed Harris shakes his head and laughs. Seated alongside writer-director-actors Noah and Logan Miller, Harris is attempting to describe the often comical route the brothers followed in moving from the crazy notion of making an autobiographical movie to the similarly crazy notion that they could actually talk Ed Harris into playing their father to, finally, tonight's red-carpeted premiere of the crazy notion itself. "Let's face it, most true stories about new filmmakers, they end before they begin," Harris says. "But these guys don't quit so easily. If you tell them no, they just assume it's something you'll say a few times until you finally say yes." The same could be said for CFI Releasing, the newly forged company assigned the job of putting Touching Home in theaters all across the country. A long-planned subsidiary of the California Film Institute (CFI), which produces the prestigious annual Mill Valley Film Festival each year, this brand-spanking-new distribution company is the brainchild of Mark Fishkin and colleagues, the folks who founded the Mill Valley Film Festival in 1978 and who 10 years ago went into the year-round exhibition business with the beloved Christopher B. Smith Rafael Film Center. Joining other shiny-fresh distribution firms such as Tribeca Film, NeoClassics, Cinema Purgatorio and South by Southwest, which recently launched an effort to release films through video-on-demand, Fishkin says that the idea of creating CFI Releasing was dreamed up long ago and has steadfastly refused to go away. "The idea of CFI having a nonprofit theatrical distribution arm has been part of our strategic plan for close to 10 years," Fishkin says, speaking in his office six weeks after the theatrical premiere of Touching Home. "We've been talking about doing this since the Rafael Film Center opened," he says, recalling a recent phone call from CFI's former director of operations, who reminded Fishkin, "You used to talk about this all the time." Since its late April release, the somewhat baseball-themed Touching Home—the making of which is outrageously described in the Millers' book Either You're In or You're in the Way—has screened all over the Bay Area, stretching east to New York City and Tampa, Fla., where the Millers were invited to throw out the first pitch at a Tampa Rays baseball game while the movie trailer played on the scoreboard. It's also opened in Denver, Colo., at the Stars Encore Theater. "We're very excited," Fishkin explains, "because the Stars is run by the same nonprofit that does the Denver Film Festival. So we feel very comfortable with them." Whereas mainstream films are usually released everywhere all at once, CFI Releasing has adopted a slow, calculated roll-out, much like what was done back in the '70s with many studio films. According to Fishkin, the two-or-three-screens-at-a-time plan allows CFI to send the Miller brothers out to nearly every launch, where they do Q&A's, work the local press, visit baseball stadiums, do book signings—anything to draw extra attention to the film. Part of the idea is to use the Millers' remarkable story to form a connection with potential audiences, who seem eager to see the film after learning about their hardscrabble West Marin life and alcoholic father, their almost realized childhood dream of playing in the Major Leagues, and the way they charmed a four-time Oscar nominee into giving one of the greatest performances of his career in their little independent film. That fusion of film distribution and showmanship is at the heart of Fishkin's vision for CFI, and is exactly what he feels other small independent distributors will need to do in order to survive. "There are a number of people who are talking about the same things," Fishkin explains, "that in order for theatrical films to succeed there has to a sense of that 'event experience.' Our idea was to take the best of the festival experience, couple it with the things that worked from the great art house period and create a new model of exhibition. We're trying to do that with Touching Home, and it seems to be working. By sending Logan and Noah out to do Q&A's, we're giving audiences an extra reason to care. Obviously, you can't put the filmmaker in every theater in the country, but it's important for independent distributors—as well as the responsibility of the independent exhibitors—to create that kind of event surrounding the release and exhibition of a new film." For Fishkin and the California Film Institute, the decision to enter the world of film distribution all goes back to CFI's original mission statement. "Our mission is to celebrate film as art and education," he explains. "We have two major constituents we serve: the independent filmmakers and the community of filmgoers. The work we do has always been about supporting and expanding the mission, and we do that in different ways. Originally, we did it with the festival. We do it with CFI Education. Then we added the Rafael. All of these things are ways we can support our constituencies. "We have always been about giving the public access to films they might not normally get to see, assisting independent filmmakers in getting their films out in front of the right audiences, expanding the public's appreciation and understanding of film. With CFI Releasing, we can explore new and different ways [of putting audiences together with films], that we think aren't being done by the profit-making sector." Not that anyone expects it to be easy. Independent cinema, once a thriving cottage industry that gave hope to hundreds of up-and-coming filmmakers, has been in a state of flux for years. Twenty years ago, every major studio had its own art-film side business; nearly all of them are gone now. Movie theaters, many of which used to keep a number of screens available for "small films," foreign films and weird independent films, are much less willing to take a risk in such fare, and as a result distributors are much more choosy about which films they will gamble on. A number of small distributors have, like CFI, turned into nonprofit enterprises, the same way that live theater did many, many years ago. There was a time when all stage theaters were for-profit. Now, very few of them are, because they couldn't sustain themselves that way. Fishkin believes we'll be seeing more of the same in the very near future. "To me, our nonprofit world is one of the great successes of this country," he says. "The fact that individuals, corporations and foundations still support cultural activities is a remarkably positive thing about the United States. We don't have the support from the government that other countries have. But we have this other consciousness, the nonprofit consciousness. I think that's important, and it differentiates us from the rest of the world." Currently in negotiations for a small documentary film he saw at the Cannes Film Festival, Fishkin is confident that Touching Home is just the beginning for CFI Releasing. "There is a particular kind of film we want to distribute," he says. "It has to have something significant to say, it has to be entertaining and unusual, and it has to have a strong sense of quality and craftsmanship. We've had a couple of other very interested filmmakers who'd like us to release their films as well. "The whole independent film industry, at this time, is in a tremendous state of change and evolution," Fishkin adds, "but these are times that also create opportunities. We see those opportunities. In the future, there will be many more nonprofits jumping into the distribution arena. It's clear that that's the way things will be going. We're not alone, that's for sure."